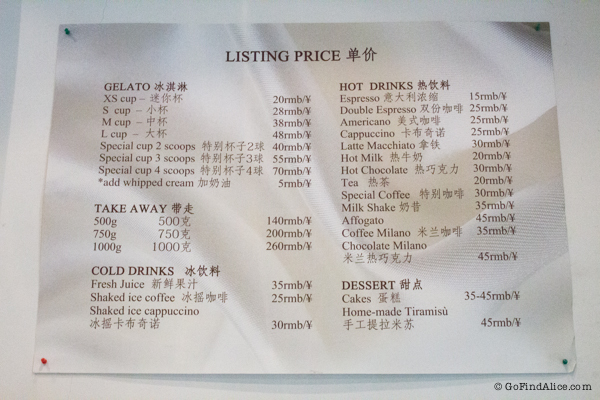 I heard that this is the best gelateria in Shanghai. If that is true, then Shanghai needs to step up on its gelato offerings. Gelato uses more milk as opposed to cream and egg yolks ice cream. Hence gelato has a lower fat content. Gelato contains less air as it is churned at a much slower speed (less overrun) than ice cream. Gelato is served at a slightly higher temperature than ice cream (otherwise it would be too frozen). My friend and I tried a couple of flavors and in the end both decided to get a scoop each of their signature “Le Creme Milano” flavor (Hazelnut, Ferrero Rocher, Nutella chocolate mixing). We both agreed that the taste was a little off. It didn’t have the full, rich and smooth delicacy that bona fide gelato in Europe has (eg. Amorino, Berthillon, Gelupo).